The strongest military in the world cannot protect a fragile economy,” Hyman said. “Without financial strength, the United States could become a has-been. Modern warfare is constantly evolving. National security focuses primarily on preventing terrorist attacks and maintaining a strong, secure cyber network. Economic security is typically an afterthought to the general public, but the destabilization of global markets could be more devastating than any physical or digital attack the world has ever seen. Few people understand this better than Michael Hyman and Andrew Capon, with over 50 years of experience in market analysis between them. 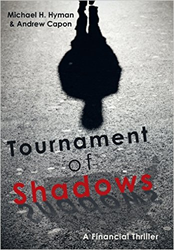 Their new novel, “Tournament of Shadows,” is a unique financial thriller that demonstrates the latent danger of a potential economic collapse. While the book concerns itself with a fictional story about a conspiracy to cripple the U.S., Hyman and Capon found inspiration for the plot in both history and current events. For more information, visit http://www.tournamentofshadowsnovel.com/. Michael Hyman cut his teeth in the London markets of the 1980s and ‘90s after completing his post-graduate studies at the London School of Economics. He is the founder of several financial start-up firms, including GH Asset Management Ltd., a global fixed income boutique in London. He is the author of the books "The Power of Global Capital: New International Rules-New Global Risks" and "New Ways for Managing Global Financial Risks – The Next Generation." Andrew Capon is Head of Strategic Communications at Insight Investment, the United Kingdom’s biggest active fund manager. He has twenty years of experience in financial markets as a senior investment analyst, strategist, and award-winning journalist.